Alpine Limousine is the premier Miami and Ft. Lauderdale service around South Florida. Once you let Alpine Limousine be the transportation for your Miami PROM limousine, you will want to graduate...again! We offer the best, most complete and wellprepared New York prom limousine service possible for your special day. Prom is one of the most special days of your high school career and we want to add the finishing touch. 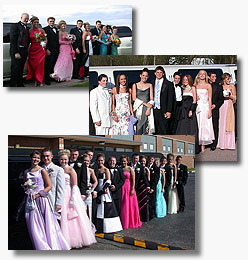 We are prom limousine night experts that can make your prom the most memorable time of your life. Our fleet of stretch limousines is fully equipped with Color TV, VCR, Stereo Sound System, Complimentary Soft Drink Bar and much more. Or, get a group of classmates together and we can fit everyone in our Deluxe Limousine Bus!